Once again, an entire week has flown away from me! With all the lead up to my nephew’s wedding, I thought I’d have a little more by the way of knitting and such to show but somehow, I’ve not managed a lot other than to keep up with the Oliver Twist MKAL. I did complete Clue 4 and it’s official… I love nupps! 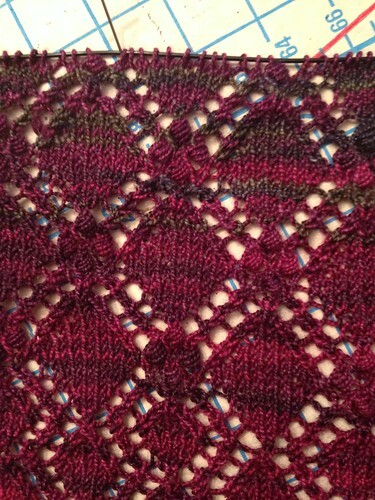 I’m still working away on “Blob”, which is beginning to look cuddly and wearable. I’ve a second skein to work with that’ll give a unique “dip dye” effect to the prototype, one that I hope will catch the interest of some knitters once it’s published. The Manos “Fino” is a gorgeous yarn, I’m already plotting ways to buy more. A little excitement with my furnace this week, though it’s been so warm, there’s hardly a need. I did have a broken igniter but an efficient repair man and a service contract so all worked out beautifully and winter can begin whenever it chooses to get here. The itinerary for this year’s version of The Needler’s Retreat was emailed out early this week and I am thrilled! My BFF, the very talented Francine Hebert of “Fancy That” yarn jewellery, will be teaching a class in knitting with silk hankies. I fully expect that my efforts at class clown will be appreciated by all our teachers this year. Once again, the venue is the gorgeous Glen House in Gananoque on the St. Lawrence and we have our favourite room as per usual (party is at Frankie and Kar’s! 😉 ) I was really happy that we don’t have any homework to do before this year’s classes; I’m already doubting I’ll have much finished (ie: blocked) for Show ‘N Tell. This entry was posted in Classes, Retreats and Workshops, Design, KeiB Knitting & Crochet Patterns, Knit-offs and Mystery, Knitting, Projects, Scaves and Cowls and tagged Crochet, Design, Earthfaire, Gananoque, Janine Le Cras, Knitting, Lace Projects, Needler's Retreat, Oliver Twist Mystery KAL, Shawls, Sheeps Ahoy, The Bishop's Sleeves Scarf, The Glen House, Unique Sheep Yarns. Bookmark the permalink.